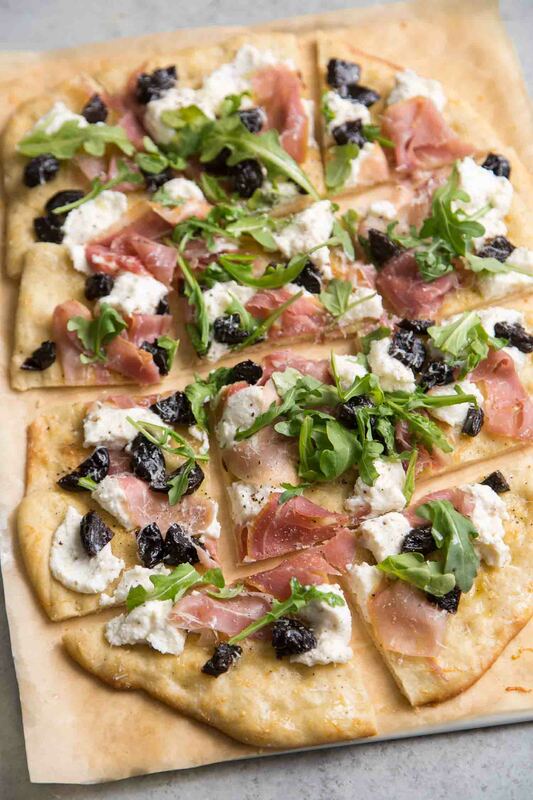 This Ricotta Flatbread with California Prunes and Jamon Serrano recipe is sponsored by California Prunes through Kitchen PLAY. As always, all opinions mentioned here are entirely my own. What is the difference between pizza and flatbread? What about focaccia and flatbread? I’ve got a ton more questions, but it all depends on your definition of pizza, flatbread, and focaccia. 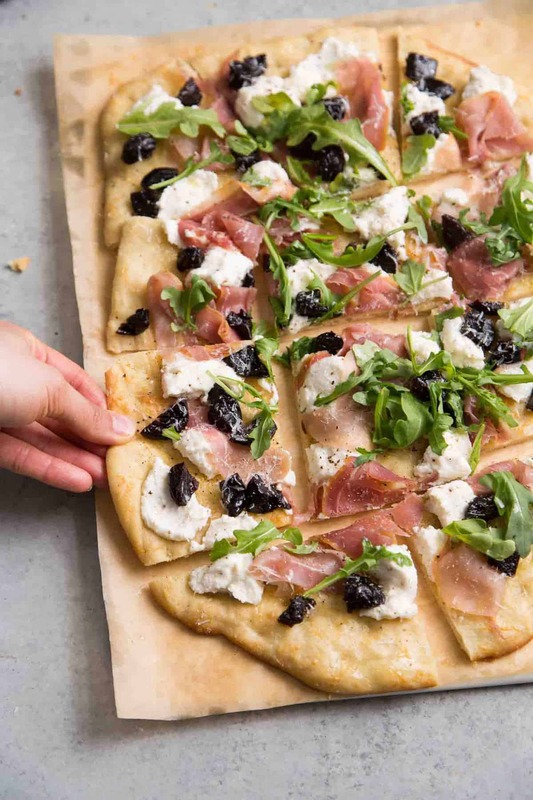 This ricotta flatbread is a hybrid/mash-up of sorts. I’ve taken my favorite parts of pizza, flatbread, and focaccia and melded them into this delicious quick-fix meal. I like the toppings associated with pizza, the thin crust of flatbread, and the flavors of focaccia. 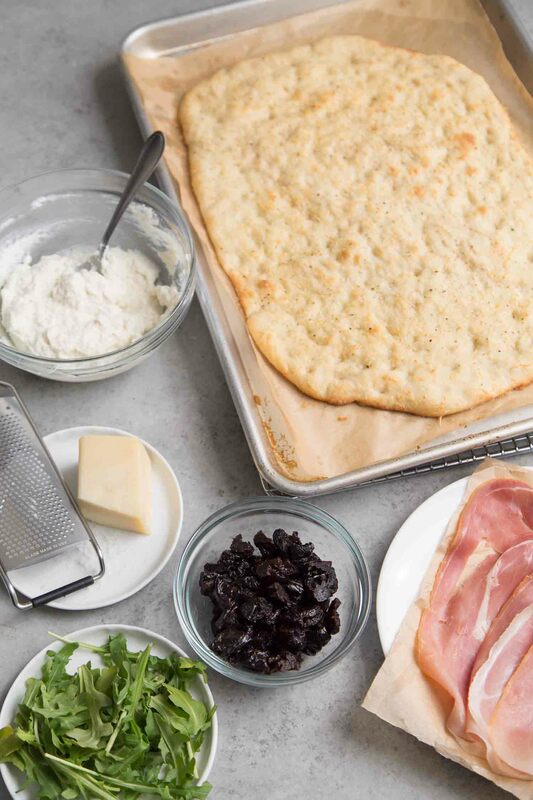 Let’s start with the toppings that make this ricotta flatbread so tasty. It’s all about balance. You need a combination of sweet, salty, savory, and something unexpected to keep things interesting and exciting. 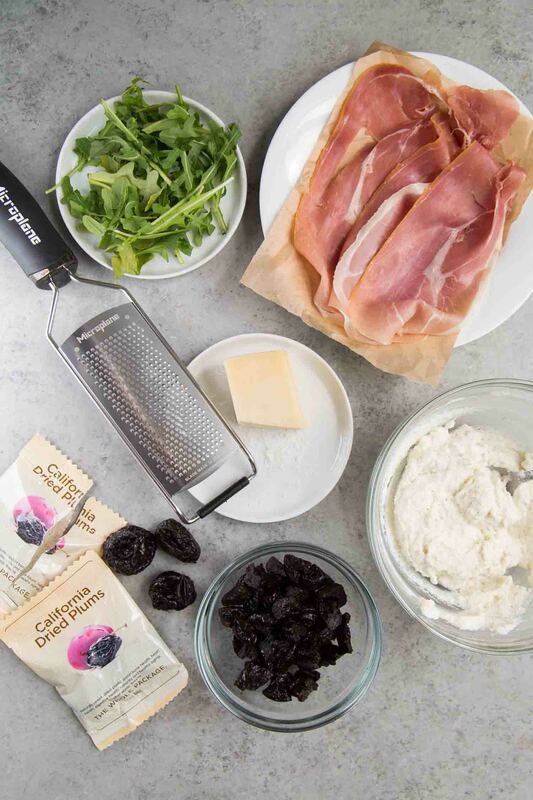 We’ve got sweet creamy ricotta paired with salty Romano cheese, savory slices of jamon Serrano, fresh peppery arugula, and for the element of surprise- California prunes! 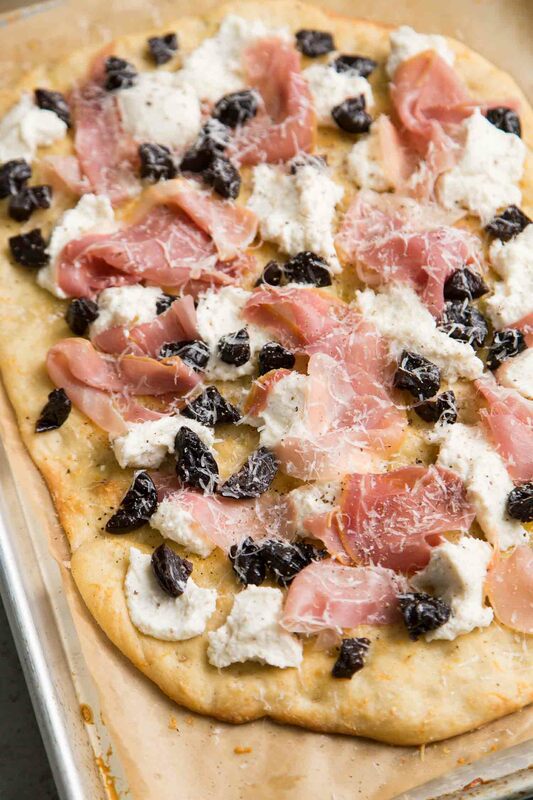 You must be thinking… prunes on a flatbread pizza? Is that any good? YES IT IS. Fruits on pizza is nothing new. Pineapple, fig, pear, and apple have long been enjoyed alongside pepperoni, ham, and cheese. Prunes (aka dried plums) add a pleasant sweetness that balances out the salty jamon and cuts through the ricotta and Romano cheese. What makes California prunes special? Asides from its addition of flavor and texture, what makes California prunes so great? They’re good for you! California prunes provide nutrients and health benefits. A serving of prunes (4-5 pieces) can help support good digestive health. Think fiber! California prunes have copper and vitamin K. Copper aids in bone structure. Vitamin K helps to improve calcium balance and promotes bone mineralization. I made this ricotta flatbread using store-bought pizza dough. Instead of rolling it out into a circle, I flattened it into a large rectangle. In place of pizza dough, you can sub in pita bread, naan, lavash, bagel, French bread, etc. The options are endless! Preheat oven to 475 degrees F. Line 18 x 13-inch baking pan with parchment paper or silicone mat. Lightly grease parchment. Stretch, flatten, or roll dough to a large thin rectangle, about the size of baking pan. Poke your fingers all over the top of the dough to make little indents. Drizzle olive oil over stretched dough. Lightly season with salt and pepper. Sprinkle about 1-2 tablespoons of grated Romano cheese over dough. Bake for 12-15 minutes until flatbread is golden in color and cheese has melted. Remove from oven and add toppings. While flatbread is baking, mix together ricotta cheese, salt, pepper, and nutmeg. Keep chilled until ready to assemble. Drizzle extra-virgin olive oil over baked flatbread. Distribute dollops of seasoned ricotta over flatbread. Add Jamon Serrano and chopped prunes. Grate Romano cheese on top. Finish with arugula. Season with salt/pepper or additional cheese as needed. If desired, drizzle additional olive oil before serving. In place of pizza dough, you can sub in naan, lavash, pita, or any bread of choice. This looks delicious. I have been eating flatbread in Germany fo a while. Thanks Gerlinde! I hope you give the recipe a try! 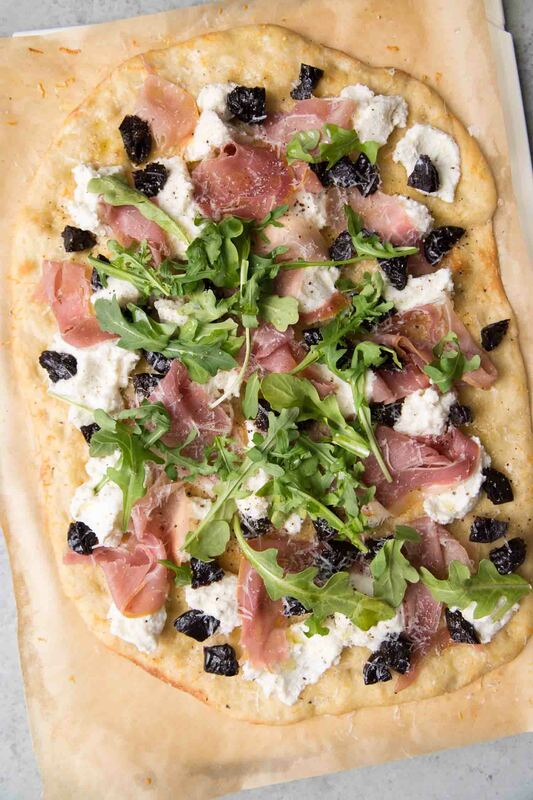 I have ricotta and prosciutto in my fridge – making this this weekend- YUM!! Love the sound of this combination on a flatbread – a lovely sweet-savory mix. This looks amazing!! I love flatbread. Those prunes and their sweetness would pair perfectly with the serrano! Thanks so much! Prunes and Jamon are a great pair!